"Sufjan" redirects here. For people with similar names, see Sufyan. 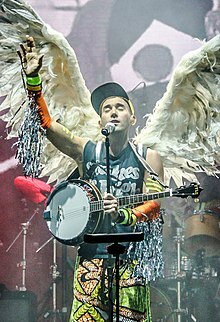 Sufjan Stevens (/ˈsuːfjɑːn/ SOOF-yahn; born July 1, 1975) is an American singer-songwriter and multi-instrumentalist. His debut album A Sun Came was released in 1999 on the Asthmatic Kitty label, which he cofounded with his stepfather. He received wide recognition for his 2005 album Illinois, which hit number one on the Billboard Top Heatseekers chart, and for the single "Chicago" from that album. He received an Academy Award nomination for Best Original Song and a Grammy Award nomination for Best Song Written for Visual Media for "Mystery of Love" from the movie Call Me by Your Name. Stevens has released albums of varying styles, from the electronica of Enjoy Your Rabbit and the lo-fi folk of Seven Swans to the symphonic instrumentation of Illinois and Christmas-themed Songs for Christmas. Stevens makes use of a variety of instruments, often playing many of them himself on the same recording, and writes music in various time signatures. Although his songs periodically feature Christian themes, he has repeatedly stated an intent to separate his beliefs from his music. Stevens was born in Detroit, Michigan, and lived there until the age of nine, when his family moved to Petoskey, in the northern part of the Lower Peninsula of Michigan. He was raised by his father Rasjid and his stepmother Pat, only occasionally visiting his mother, Carrie, in Oregon after she married her second husband Lowell Brams. His mother is deceased. Brams later became the head of Stevens' record label Asthmatic Kitty. Stevens is of Lithuanian and Greek descent. Stevens attended the Detroit Waldorf School, Petoskey High School and Interlochen Arts Academy, and graduated from Harbor Light Christian School. He then attended Hope College in Holland, Michigan, where he graduated Phi Beta Kappa, and then earned an MFA from The New School in New York City. Sufjan is an Arabic name, meaning "comes with a sword". It predates Islam and most famously belonged to Abu Sufyan, a figure from early Islamic history. The name was given to Stevens by the founder of Subud, an inter-faith spiritual community to which his parents belonged when he was born. A multi-instrumentalist, Stevens is known for his use of the banjo, but also plays guitar, piano, drums, woodwinds, and several other instruments, often playing all of these on his albums through the use of multitrack recording. While in school, he studied the oboe and English horn, which he also plays on his albums. Stevens did not learn to play the guitar until his time at Hope College. Stevens lives in Kensington, Brooklyn, in New York City, where he makes up the Brooklyn staff of Asthmatic Kitty Records. In a 2005 interview, he said he attends an Anglo-Catholic Episcopal Church. His brother Marzuki Stevens is a formerly recognized road runner, who competed in the marathon and other distances. Stevens began his musical career as a member of Marzuki, a folk-rock band from Holland, Michigan, as well as garage band Con Los Dudes. He also played (and continues to play) various instruments for Danielson Famile. While in his final semester at Hope College, Stevens wrote and recorded his debut solo album, A Sun Came, which he released on Asthmatic Kitty Records. He later moved to New York City, where he enrolled in a writing program at the New School for Social Research. During his time at the New School, Stevens developed a preoccupation with short story that he believed would lead him to write a novel, but ultimately returned him to songwriting. While in New York, Stevens composed and recorded the music for his second album, Enjoy Your Rabbit, a song cycle based around the animals of the Chinese zodiac that delved into electronica. Stevens followed this with the first album to be released as a part of his "Fifty States Project", a collection of folk songs and instrumentals inspired by his home state of Michigan. The result, the expansive Michigan, included odes to cities including Detroit and Flint, the Upper Peninsula, and vacation areas such as Tahquamenon Falls. Melded into the scenic descriptions and characters are his own declarations of faith, sorrow, love, and the regeneration of Michigan. Following the release of Michigan, Stevens compiled a collection of songs recorded previously into a side project, the album Seven Swans, which was released in March 2004. Stevens did not leave his job in the children's book division at Time Warner until touring for Seven Swans. Next he released the second in the 50 states project, titled Illinois. Among the subjects explored on Illinois are the cities of Chicago, Decatur and Jacksonville; the World's Columbian Exposition of 1893, the death of a friend on Casimir Pulaski Day, the poet Carl Sandburg, and the serial killer John Wayne Gacy. Over the 2005 winter holidays, Stevens recorded an album with Rosie Thomas and Denison Witmer playing banjo and providing vocals. In April 2006, Pitchfork erroneously announced that Stevens and Thomas were having a baby together, and were forced to print a retraction. Witmer and Thomas later admitted it was an April Fools' prank. In December 2006, the collaborative recordings were digitally released by Nettwerk as a Rosie Thomas album titled These Friends of Mine. The album was released in physical form on March 13, 2007. On September 11, 2006, in Nashville, Tennessee, Stevens debuted a new composition, a ten-minute-plus piece titled "Majesty Snowbird". On November 21, 2006, a five CD box set Songs for Christmas was released, which contains originals and Christmas standards recorded every year since 2001 (except 2004). Stevens undertook in the project initially as an exercise to make himself 'appreciate' Christmas more. The songs were the work of an annual collaboration between Stevens and different collaborators, including minister Vito Aiuto; the songs themselves were distributed to friends and family. In April 2007, in Brooklyn and Philadelphia, Stevens made unannounced appearances on Thomas's tour in support of this album. In 2007, he did a Take-Away Show acoustic video session shot by Vincent Moon standing on a roof in Cincinnati. In 2007, he played shows sporadically, including playing at the Kennedy Center to celebrate the tenth anniversary of the Millennium Stage concerts. He was commissioned by the Brooklyn Academy of Music to create a "music and film work" titled The BQE, described as "a symphonic and cinematic exploration of New York City's infamous Brooklyn-Queens Expressway". It premiered at BAM's Next Wave festival on November 1–3, 2007. Stevens has also worked as an essayist, contributing to Asthmatic Kitty Records' "Sidebar" feature and Topic Magazine. He wrote the introduction to the 2007 edition of The Best American Nonrequired Reading, a short story about his early childhood education and learning to read titled How I Trumped Rudolf Steiner and Overcame the Tribulations of Illiteracy, One Snickers Bar at a Time. That winter, he hosted an "Xmas Song Exchange Contest" in which winner Alec Duffy won exclusive rights to the original Stevens song "Lonely Man of Winter." The track could only be heard by attending private listening parties at Duffy's home in Brooklyn and at places around the world until 2018, when Duffy negotiated with Athsmatic Kitty Records to release the song with all proceeds going towards Duffy's organization JACK. Stevens has contributed to the music of Denison Witmer, Soul Junk, Half-handed Cloud, Brother Danielson, Danielson Famile, Serena Maneesh, Castanets, Will Stratton, Shannon Stephens, Clare & the Reasons, Little Scream, and Liz Janes. In 2007 alone, Stevens played piano on The National's album Boxer, produced and contributed many instrumental tracks to Rosie Thomas's album These Friends of Mine, multiple instruments on Ben + Vesper's album All This Could Kill You and oboe and vocals to David Garland's 2007 album Noise in You. He has contributed covers of Tim Buckley ("She Is"), Joni Mitchell ("Free Man in Paris"), Daniel Johnston ("Worried Shoes"), John Fahey ("Variation on 'Commemorative Transfiguration & Communion at Magruder Park"), The Innocence Mission ("The Lakes of Canada"), Bob Dylan ("Ring Them Bells"), Drake ("Hotline Bling"), Prince ("Kiss") and The Beatles ("What Goes On") to various tribute albums. His versions of "Free Man in Paris" and "What Goes On" are notable for only retaining the lyrics of the original, as Stevens has taken his own interpretation on the melody and arrangement. His rendition of "The Star Spangled Banner" has a similar rearranged melody and arrangement as well as a whole new verse. His songs "The Tallest Man, The Broadest Shoulders" and "All the Trees of the Field Will Clap Their Hands" were featured in the 2006 British comedy-drama Driving Lessons, starring Harry Potter's Julie Walters and Rupert Grint. In 2008, he produced Welcome to the Welcome Wagon, the debut album of Brooklyn-based husband and wife duo Vito and Monique Aiuto, The Welcome Wagon. In February 2009, Stevens contributed "You Are the Blood" to the AIDS benefit album Dark Was the Night produced by the Red Hot Organization. In April 2009, Stevens uploaded a song about director Sofia Coppola online. This song was written while Stevens was in college, from a series of songs about names. A few weeks later, our dog got hit by a snowplow and I forgot all about the problem of names. Until college, when I learned to play the guitar, and, as an exercise, started writing songs (very poorly executed) in the same way that Henry Ford produced the automobile: assembly-line-style. I wrote songs for the days of the week (poor Monday!). Songs for the planets (poor Pluto!). Songs for the Apostles (poor Judas!). And, finally, when all else failed, I started a series of songs for names. [...] Each piece was a rhetorical, philosophical, musical rumination on all the possible names I had entertained years before when my parents had given me the one chance to change my own. Oh fates! I sang these songs in the privacy of my dorm room, behind closed doors, pillows and cushions stuffed in the air vents so no one would hear. And then I almost failed Latin class, my grades plummeted, my social life dissolved into ping pong tournaments in the residence halls, and, gradually, my interest in music (or anything divine, creative, fruitful, enriching) completely waned. I turned to beer. And cigarettes. And TV sitcoms. And candy bars. Oh well! A perfectly good youth wasted on junk food! That is, until a few months ago, when I came across some of the old name songs, stuffed onto tape cassettes, 4-track recorders, forgotten boxes, forgotten shelves, forgotten hard drives. It was like finding an old diary, or a high school yearbook, senior picture with lens flare and pockmarks, slightly cute and embarrassing. What was I thinking? In September 2009, Stevens began performing four new songs while on his Fall tour, "All Delighted People", "Impossible Soul", "Too Much" and "Age of Adz". That year Stevens contributed to an album with his step father, Lowell Brams, entitled Music For Insomnia. The album was released December 8, 2009. In November 2009, Stevens admitted to Exclaim! Magazine, in regard to the fact that he recently called his fifty-state project a joke, that "I don't really have as much faith in my work as I used to, but I think that's healthy. I think it's allowed me to be less precious about how I work and write. And maybe it's okay for us to take it less seriously." In June 2010, The National's Bryce Dessner claimed Stevens was at work on his next full-length album and stated the band was working on the new album. In October 2012, a second set of Christmas albums to be released by Stevens was announced and released in November, titled Silver & Gold: Songs for Christmas, Vols. 6–10. In March 2015, Sufjan released Carrie & Lowell, which is his seventh studio album released since 2000. In December 2017, Stevens released two versions of "Tonya Harding," a song about the figure skater Tonya Harding. According to Stevens, "I've been trying to write a Tonya Harding song since I first saw her skate at the U.S. Figure Skating Championships in 1991. She's a complicated subject for a song partly because the hard facts of her life are so strange, disputable, heroic, unprecedented, and indelibly American." Beginning with the album Michigan, Stevens announced an intent to write an album for each of the 50 U.S. states. Several years after completing a second state-themed album, Stevens admitted that the project had been a "promotional gimmick" and not one he had seriously intended to complete. Stevens had spent the second half of 2004 researching and writing material for the second album, Illinois. As with Michigan, Stevens used the state of Illinois as a leaping-off point for his more personal explorations of faith, family, love, and location. Though slated for general release on July 5, 2005, the album was briefly delayed by legal issues regarding the use of Superman in the original album cover artwork. In the double vinyl release, a balloon sticker has been placed over Superman on the cover art of the first 5,000 copies. The next printings had an empty space where the Superman image was, as with the CD release. "Come On! Feel The Illinoise!" The widely acclaimed Illinois was the highest-rated album of 2005 on the review aggregator website Metacritic based on glowing reviews from Pitchfork, The Onion A/V Club, Spin, Billboard, Entertainment Weekly, Rolling Stone, The New York Times, KEXP, and The Guardian. The 2006 PLUG Independent Music Awards awarded Stevens with the Album of the Year, Best Album Art/Packaging, and Male Artist of the Year. Pitchfork, No Ripcord, and Paste magazine named Illinois as the editors' choice for best album of 2005, and Stevens received the 2005 Pantheon prize, awarded to noteworthy albums selling fewer than 500,000 copies, for Illinois. In April 2006, Stevens announced that 21 pieces of music he had culled from the Illinois recording sessions would be incorporated into a new album, called The Avalanche, which was released on July 11, 2006. Although Stevens' subsequent work was sometimes speculated to tie into future "States" projects, and Stevens himself would make occasional statements alluding to the future of the project, The Guardian published an interview with Stevens in 2009 in which he stated in relation to the Fifty States Project: "I have no qualms about admitting it was a promotional gimmick." On May 31, 2007, Asthmatic Kitty announced that Stevens would be premiering a new project titled The BQE in early November 2007. The project, dubbed a "symphonic and cinematic exploration of New York City's infamous Brooklyn-Queens Expressway", was manifested in a live show. The BQE featured an original film by Stevens (shot in Super 8 mm film and standard 16 mm), while Stevens and a backing orchestra provided the live soundtrack. The performance used 36 performers which included a small band, a wind and brass ensemble, string players, horn players, and hula hoopers. There were no lyrics to the music. The BQE was commissioned by the Brooklyn Academy of Music as part of their Next Wave Festival and performed on three consecutive nights from November 1–3, 2007. The performance sold out the 2,109 seat BAM Opera House without any advertising. After three weeks of rehearsing the piece with the three dozen musicians involved, he presented the 30-minute composition. The BQE was followed by an additional one hour of concert by Stevens and his orchestra. The BQE won the 2008 Brendan Gill Prize. The multimedia package was released on October 20, 2009. The release included a CD of the show's soundtrack, a DVD of Brooklyn-Queens Expressway footage that accompanied the original performance (not a film of the performance itself), a 40-page booklet with liner notes and photos, and a stereoscopic 3D View-Master reel. A limited edition version that features the soundtrack on 180-gram vinyl and a 40-page BQE-themed comic book starring the show's hula hooping wonder women, the Hooper Heroes, was also released. On October 6, 2009, Stevens' label, Asthmatic Kitty Records, released an album of versions of his 2001 album Enjoy Your Rabbit rearranged for strings and performed by the Osso String Quartet, entitled Run Rabbit Run. Stevens (pictured here performing in 2011) returned to recording and touring in 2010 after a hiatus. In 2010, Stevens was featured on The National's album High Violet, released in May, and sang backing vocals for the band on the Late Show with David Letterman. Following the release of High Violet, band frontman Matt Berninger mentioned that Stevens was recording a new album in the band's studio and that The National would appear on some of the tracks. In early August, Stevens announced North American tour dates across dozens of cities. On August 20, 2010, Stevens suddenly and unexpectedly released a new collection of tracks, the All Delighted People EP, for digital download. The EP is built around two versions of the title track, "All Delighted People." The EP surprisingly rose to #27 on the Billboard 200 albums solely through its digital sales. On August 26, Asthmatic Kitty announced that Stevens would release his newest full-length album, The Age of Adz, on October 12. NPR streamed the album until it was released on October 12, 2010. The two albums featured a wide range of arrangements, from orchestral to electronic. Song lengths were also extended; the track "Djohariah" from All Delighted People is 17 minutes long, while "Impossible Soul" from The Age of Adz is 25 minutes long. The albums also feature many styles from disco to folk. Stevens has stated in interviews that in 2009/10, he suffered from a mysterious debilitating virus infection that affected his nervous system. He experienced chronic pain and was forced to stop working on music for several months. He said: "The Age of Adz, is, in some ways, a result of that process of working through health issues and getting much more in touch with my physical self. That's why I think the record's really obsessed with sensation and has a hysterical melodrama to it." On October 12, 2010, Stevens began his North American tour in Montreal, featuring virtually all new material. The tour lasted just over a month and ended on November 15, 2010 in New York City. Stevens toured Australia and New Zealand in early 2011, featured as part of the Sydney Festival, and appeared on-stage with The National during the last of three sold-out Auckland shows. He also toured Europe and the United Kingdom in April and May 2011, playing there for the first time in five years. His shows mostly consisted of new material, but he did play many older tracks from Seven Swans and Illinois. Stevens ended the Age of Adz tour with two shows in Prospect Park, Brooklyn, New York. Stevens collaborated with choreographer Justin Peck on two ballets for the New York City Ballet: Year of the Rabbit (2012) and Everywhere We Go (2014), both to great critical acclaim. Stevens' stage shows feature elaborate lighting, costumes, and choreography. On February 27, 2012, it was announced Stevens would release a collaborative EP called Beak & Claw, on March 20, with artists Son Lux and Serengeti under the name S / S / S on the Anticon record label. Stevens released a 7" with close friend Rosie Thomas for Record Store Day 2012, entitled Hit & Run Vol. 1. Stevens, along with fellow Brooklyn musicians, Nico Muhly and Bryce Dessner began performing their classical project, Planetarium, a song-cycle based around the planets in our solar system in countries such as England, The Netherlands, Australia and France from March to July 2012. On October 2, 2012, it was announced that Stevens would release a second set of Christmas albums, Silver & Gold: Songs for Christmas, Vols. 6-10, on November 13, 2012. Silver & Gold contains 58 songs, allowing for a total of 100 when combined with his first set of Christmas albums, Songs for Christmas. To support this new release, Stevens performed in 24 cities around the United States for his 2012 tour titled, "The Sirfjam Stephanapolous Christmas Sing-A-Long Seasonal Affective Disorder Spectacular Music Pageant Variety Show Disaster." 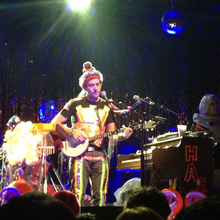 Sufjan Stevens performing at Fete Music in Providence, RI, as part of his "The Sirfjam Stephanapolous Christmas Sing-A-Long Seasonal Affective Disorder Spectacular Music Pageant Variety Show Disaster" tour in 2012. On December 11, 2012, Stevens released Chopped and Scrooged, a Christmas-themed hip-hop mixtape featuring music from Silver & Gold. In 2012, Stevens' mother Carrie died of stomach cancer. His process of grieving and coming to terms with their relationship led to the songwriting on his 2015 album Carrie & Lowell. As a part of Joyful Noise's 2013 Flexi Disc Series, Stevens and Cat Martino, of Stranger Cat, recorded the single "Take the Time". Martino has contributed to many of Stevens' past projects including The Age of Adz. On March 18, 2014, Stevens released the self-titled album, Sisyphus, with Son Lux, and the rapper Serengeti. On January 12, 2015, Asthmatic Kitty Records announced that Stevens would release a new LP called Carrie & Lowell on March 31, 2015 (Europe: March 30, 2015). On February 16, 2015, Stevens shared the first single from the record, "No Shade in the Shadow of the Cross". The album met with critical acclaim on release, receiving a 9.3 from Pitchfork under "best new music", and an initial score of 90 from Metacritic. UK retailer HMV named it the best album of 2015. The album follows the nuances and trials of life with Stevens' mother, Carrie, who was diagnosed bipolar and schizophrenic, was addicted to drugs, and abandoned him when he was a year old; it also includes Stevens' stepfather, Lowell Brams. On January 26, 2015, Asthmatic Kitty Records announced a tour of North America, which began in April 2015, to coincide with the new album. Stevens also headlined the End of the Road Festival in the United Kingdom in September. On July 21, a second set of U.S. tour dates, which took place in October and November 2015, was announced. On April 28, 2017, a live album and concert film, Carrie & Lowell Live was released, featuring new interpretations, re-workings and expansions of the songs from Carrie & Lowell. In addition to the live album, Stevens announced another Carrie & Lowell companion piece, The Greatest Gift, which was released on November 24. It includes four unreleased songs from the album sessions, as well as several remixes and a demo. In 2011, Dutch concert hall Muziekgebouw Eindhoven commissioned composer Nico Muhly to write a piece. He collaborated with Stevens and Bryce Dessner (of The National) to write a piece about the Solar System, which was first performed in Amsterdam in April 2012. On March 28, 2017, NPR's All Songs Considered reported that Stevens would team up with Muhly, Dessner, and James McAlister to produce a "Planetarium Project" album. The first single, "Saturn", was released in March 2017 around the announcement that a space-themed Planetarium album would be released June 9, 2017, on 4AD. NPR described the album as a "collaboration between four brilliant musicians, with lyrics from Sufjan Stevens revolving around mythology, astrology, science, astronomy and the intricacies of human consciousness." The second single, "Mercury", was released on April 25, 2017. In January 2017, it was announced that Stevens would feature original songs written and recorded by himself for the movie Call Me by Your Name, directed by Luca Guadagnino and based on André Aciman's novel of the same name. The film was released on November 24, 2017, by Sony Pictures Classics. The soundtrack of the film features two new songs by Stevens. In his review of the film, Consequence of Sound writer Dominick Suzanne-Mayer noted Stevens' score "adds to the sensation of the film as an isolated, specific capsule of an unforgettable encounter." One of the original songs is called "Visions of Gideon", and has been described as fluctuating between lush orchestrations, staccato-heavy piano refrains, and the lilting delivery of "I have loved you for the last time" in the composition. The trailer for the film features Stevens' song "Mystery of Love". Stevens has another track featured in the film: an "ethereal piano arrangement" of The Age of Adz track "Futile Devices". The film has received critical acclaim; on Rotten Tomatoes, it has an approval rating of 95%, with an average rating of 8.7/10, based on 311 reviews. In January 2018, Stevens's track "Mystery of Love" was nominated for an Academy Award for Best Original Song. On December 6, 2017, Stevens released a new song via Asthmatic Kitty Records' YouTube channel. The track, titled "Tonya Harding", plays along a clip of the eponymous skater performing at the 1991 US Figure Skating Championships. Two days later, the single was offered for digital download and streaming, to be followed later by a cassette and vinyl release, in two versions, the one featured in the video (subtitled "in D major") and a piano-only arrangement ("in Eb major"); in a short essay, Stevens revealed his intention to write a song about Harding since 1991. The track was unrelated to the biographical film I, Tonya, which was released in the same period; Stevens offered it to the film's producers, but it was rejected. Stevens' sound has been most generally associated with genres such as indie folk, alternative rock, indie rock, indie pop, baroque pop, chamber pop, folk pop, avant-garde folk, lo-fi folk, and electronica. Many of his songs have spiritual allusions, but Stevens does not identify as a contemporary Christian music artist or frequently discuss religion with the press. He told The Village Voice, "I don't think music media is the real forum for theological discussions. I think I've said things and sung about things that probably weren't appropriate for this kind of form. And I just feel like it's not my work or my place to be making claims and statements, because I often think it's misunderstood." During a 2004 interview with Adrian Pannett for Comes with a Smile magazine, when asked how important faith was to his music, he responded, "I don't like talking about that stuff in the public forum because, I think, certain themes and convictions are meant for personal conversation." In a 2006 interview, he said, "It's not so much that faith influences us as it lives in us. In every circumstance (giving a speech or tying my shoes), I am living and moving and being." In a 2010 interview, Stevens stated that he is a Christian. ^ "Grammys 2019 Nominees: The Complete List". Billboard. Retrieved December 8, 2018. ^ Peschek, David (June 25, 2004). "Sufjan Stevens, Michigan". The Guardian. London, UK. Retrieved May 2, 2008. ^ a b "Comes With A Smile – Number 15 – Summer 2004". All Good Naysayers, Speak up!. Archived from the original on July 22, 2011. Retrieved June 16, 2007. ^ a b Sylvester, Nick (August 8, 2005). "Without a Prayer". The Village Voice. Retrieved August 27, 2006. ^ Heng Hartse, Joel (April 1, 2015). "How Not to Listen to the New Sufjan Stevens Album". Christianity Today. Retrieved April 2, 2015. ^ a b c d Dombal, Ryan (February 16, 2015). "True Myth: A Conversation with Sufjan Stevens". Pitchfork. ^ McLean, Craig (July 28, 2006). "Liturgical sounds for restaurant place-mats". Retrieved May 4, 2018 – via www.telegraph.co.uk. ^ "Sufjan Stevens". Asthmatic Kitty Records. Archived from the original on November 20, 2010. Retrieved October 31, 2010. ^ a b c d e f Harrington, Richard (September 23, 2005). "Sufjan Stevens's Musical States of Mind". The Washington Post. Retrieved October 7, 2014. ^ Satran, Pamela. "Baby Name Sufjan: Meaning, Origin, And Popularity". Nameberry. Archived from the original on December 25, 2008. Retrieved December 4, 2008. ^ Odland, Jeffrey (May 12, 2004). "Junkmedia: An Interview with Sufjan Stevens". Junk Media. Archived from the original on August 13, 2006. Retrieved August 27, 2006. ^ Guarino, Mark (July 2006). "Sufjan Stevens: Wonder Boy". Harp. Archived from the original on October 31, 2006. Retrieved November 29, 2006. ^ "About Us". Asthmatic Kitty Records. Archived from the original on November 28, 2006. Retrieved November 29, 2006. ^ Murray, Noel. "Sufjan Stevens". The A.V. Club. Retrieved August 16, 2018. ^ "Marzuki Stevens". Association of Road Racing Statisticians. Retrieved December 16, 2015. ^ "Sufjan Stevens Hypothetical Tracklists". Stereogum. April 13, 2006. Retrieved November 29, 2006. ^ "Sufjan E-Mails Smack Down". Filter. April 13, 2006. Archived from the original on October 27, 2006. Retrieved November 29, 2006. ^ Crock, Jason (May 15, 2006). "Interview: Sufjan Stevens". Pitchfork. Archived from the original on November 29, 2006. Retrieved November 29, 2006. ^ "April Fools". DenisonWitmer.com. Archived from the original on April 18, 2006. Retrieved June 16, 2007. 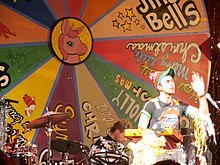 ^ "Sufjan Stevens, Paramount Theatre; Austin, TX 09-16-2006". Pitchfork. Archived from the original on December 24, 2007. Retrieved June 16, 2007. ^ "Video/MP3: Sufjan Stevens: "Majesty Snowbird" (Live)". Pitchfork. Archived from the original on December 25, 2007. Retrieved June 16, 2007. ^ "Songs For Christmas". Asthmatic Kitty Records. November 21, 2006. Archived from the original on December 5, 2006. Retrieved November 29, 2006. ^ "Sufjan Stevens and friends @ MusicNow – Sufjan Stevens and friends @ MusicNow". La Blogotheque. Retrieved October 31, 2010. ^ "Live: Sufjan Stevens; Kennedy Center, Washington D.C., 5 February 2007". Pitchfork. Archived from the original on May 9, 2007. Retrieved June 16, 2007. ^ "BQE: Helpers, hula hoops, and birds". Asthmatic Kitty Records. November 1, 2007. Archived from the original on December 27, 2008. Retrieved August 23, 2008. ^ "Sufjan Goes High Art for Brooklyn Academy of Music". Pitchfork. Archived from the original on June 26, 2007. Retrieved June 16, 2007. ^ "Sufjan Stevens Pens Personal Essay for Topic Magazine". Pitchfork. Archived from the original on December 24, 2007. Retrieved June 16, 2007. ^ "Sufjan Pens Eggers' Nonrequired Collection Intro". Pitchfork. Archived from the original on June 18, 2007. Retrieved June 16, 2007. ^ Eggers, Dave; Stevens, Sufjan (2007). The best American nonrequired reading 2007. Boston, MA: Houghton Mifflin. ISBN 0-618-90281-3. ^ "Listening to Sufjan's "The Lonely Man of Winter" in Crown Heights". The Village Voice. Archived from the original on February 11, 2009. Retrieved February 9, 2009. ^ a b "Hoi Polloi's Sufjan Stevens Winter Song Exclusive Listening Sessions". Hoi Polloi. ^ "Sufjan Stevens Releases Rare Song "Lonely Man of Winter": Listen". Pitchfork. ^ Pierce, Sheldon. "Little Scream Enlists Sufjan Stevens, The National/Arcade Fire Members, Sharon Van Etten for Cult Following LP, Shares "Love as a Weapon" Video". Pitchfork. Retrieved May 21, 2016. ^ "Sufjan Stevens covers Drake's Hotline Bling". Pitchfork. Retrieved November 2, 2015. ^ "Star Spangled Banner". Brendoman.com. Retrieved June 16, 2007. ^ Lindsay, Andrew (April 27, 2009). "Sufjan Stevens posts song about Sofia Coppola". Stereokill.net. Archived from the original on June 10, 2009. Retrieved April 27, 2009. ^ Stevens, Sufjan. "What's in a Name?". Asthmatic Kitty Records. Archived from the original on May 25, 2009. Retrieved May 17, 2009. ^ Stosuy, Brandon. "New Sufjan Stevens – "There's Too Much Love"/"Age Of Adz"/"Impossible Souls" (Live In Ithaca)". Stereogum. Retrieved October 11, 2009. ^ Michaels, Sean (October 5, 2009). "Sufjan Stevens records album of 'background music'". The Guardian. London. Retrieved October 11, 2009. ^ Khanna, Vish. "Sufjan Stevens' Inner State". Exclaim!. Archived from the original on June 16, 2010. Retrieved October 31, 2010. ^ Breihan, Tom (June 11, 2010). "Sufjan's New LP Features the National". Pitchfork. Retrieved June 14, 2010. ^ "Sufjan Stevens - Silver And Gold: Songs For Christmas Vols. 6 - 10". Uncut. Retrieved November 24, 2017. ^ "Announcing "Carrie & Lowell," a new record from Sufjan Stevens". Asthmatic Kitty Records. Retrieved November 24, 2017. ^ "Hear Sufjan Stevens' New Song For Tanya Harding". All Songs Considered. NPR. Retrieved December 6, 2017. ^ "Tonya Harding". Asthmatic Kitty Records. Retrieved December 6, 2017. ^ a b Purcell, Andrew (October 27, 2009). "Sufjan Stevens's symphony for New York". The Guardian. London. Retrieved October 28, 2009. ^ "Illinois now available on vinyl". Asthmatic Kitty Records. Archived from the original on June 9, 2007. Retrieved June 16, 2007. ^ "Best of 2005". Metacritic. Retrieved November 29, 2006. ^ Welte, Jim (March 31, 2006). "Sufjan Stevens nabs Pantheon". MP3.com. Archived from the original on December 23, 2007. Retrieved November 24, 2017. ^ Cohen, Jonathan (April 7, 2006). "Stevens revisits 'Illinois'". Monsters and Critics.com. Archived from the original on August 22, 2007. Retrieved November 29, 2006. ^ Dahlen, Chris (July 13, 2005). "Art of the States". SF Weekly. Retrieved August 10, 2009. ^ "Brinkley, Ark., Embraces 'The Lord God Bird'". National Public Radio. July 6, 2005. Retrieved August 27, 2006. ^ Yuan, Jada (February 24, 2008). "Sufjan Stevens Plans Ode to New Jersey Turnpike". New York. Retrieved October 31, 2010. ^ Botts, Nathan (November 8, 2007). "A look at the future – Sandow". Artsjournal.com. Retrieved October 31, 2010. ^ "Asthmatic Kitty Records : Sidebar". Asthmatic Kitty Records. Archived from the original on December 27, 2010. Retrieved October 31, 2010. ^ Solarski, Matthew (September 4, 2008). "Sufjan Wins Prestigious Prize for His "BQE" Thing". Pitchfork. Retrieved October 31, 2010. ^ Asthmatic Kitty Records (July 9, 2009). "Sufjan Stevens' Enjoy Your Rabbit Reimagined By Osso As Run Rabbit Run". Asthmatic Kitty Records. Archived from the original on September 4, 2011. Retrieved October 31, 2010. ^ "The National – "Afraid Of Everyone" 5/13 Letterman (TheAudioPerv.com)". YouTube. May 13, 2010. ^ "Sufjan Stevens". Sufjanstevens.bandcamp.com. October 12, 2010. ^ "Chart Moves: Katy Perry, Vampire Weekend, Cee-Lo, Taylor Swift". Billboard.biz. September 2, 2010. ^ "Sufjan Stevens The Age Of Adz". Stereogum. August 26, 2010. ^ Hilton, Robin (September 26, 2010). "First Listen: Sufjan Stevens, 'The Age Of Adz'". NPR. ^ "Sufjan Reveals Health Issues, Has Career-Best Sales Week'". Stereogum. October 22, 2010. ^ Khanna, Vish (October 22, 2010). "Sufjan Stevens Discusses His "Mysterious and Debilitating" Health Issues". Exclaim!. ^ Zuel, Bernard (January 29, 2011). "Sufjan Stevens". The Sydney Morning Herald. ^ "Sufjan Stevens Announces UK and European Tour". The Line of Best Fit. February 23, 2011. Retrieved December 10, 2017. ^ "Sufjan Stevens Teams With Son Lux and Rapper Serengeti as s / s / s, EP Due on Anticon". Pitchfork. February 27, 2012. ^ "Rosie Thomas / Sufjan Stevens". Record Store Day. Retrieved October 14, 2012. ^ Beaumont, Mark (April 10, 2012). "Sufjan Stevens, Nico Muhly and Bryce Dessner – review". The Guardian. London. Retrieved October 14, 2012. ^ "New Sufjan Christmas boxset". Asthmatic Kitty Records. Archived from the original on October 5, 2012. ^ "Sufjan Stevens to Bring Christmas Tour to U.S." Asthmatic Kitty Records. Retrieved October 30, 2012. ^ Battan, Carrie; Minsker, Evan (December 11, 2012). "Here's Sufjan's Christmas Rap Mixtape Chopped and Scrooged, With Das Racist, Kitty Pryde, More". Pitchfork. Retrieved December 12, 2012. ^ "Sufjan Stevens and Cat Martino Team for "Take the Time", Amazing Photo". Pitchfork. October 7, 2014. Retrieved December 13, 2015. ^ "Announcing...Sisyphus". Joyful Noise Recordings. Archived from the original on March 13, 2014. Retrieved March 12, 2014. ^ "Listen: Sufjan Stevens, Son Lux, and Serengeti Announce LP as Sisyphus, Share "Calm It Down"". Pitchfork. Retrieved October 7, 2014. ^ "Announcing "Carrie & Lowell," a new record from Sufjan Stevens". Asthmatic Kitty Records. Retrieved January 12, 2015. ^ Coughlan, Jamie. "Sufjan Stevens Shares 'No Shade In The Shadow Of The Cross'". Overblown. Retrieved February 16, 2015. ^ a b "Sufjan Stevens, Carrie & Lowell". Pitchfork. Retrieved March 31, 2015. ^ "Carrie & Lowell". Metacritic. Retrieved March 31, 2015. ^ "Sufjan Stevens to Tour US". Asthmatic Kitty Records. Retrieved January 26, 2015. ^ "New Sufjan Tour Just Announced". Asthmatic Kitty Records. Retrieved July 21, 2015. ^ "Carrie & Lowell Live". Bandcamp. Retrieved August 19, 2017. ^ "Sufjan Stevens Announces New Mixtape The Greatest Gift". Pitchfork. Retrieved August 19, 2017. ^ "The official website for independent record label 4AD". 4AD. Retrieved April 24, 2017. ^ a b "Watch Sufjan Stevens, Bryce Dessner, Nico Muhly Perform Three New Compositions in Amsterdam". Pitchfork. Retrieved April 24, 2017. ^ "M RECORDINGS EINDHOVEN". Muziekgebouw Eindhoven.nl. Archived from the original on August 7, 2017. Retrieved November 24, 2017. ^ Hilton, Robin; Bolen, Bob (March 28, 2017). "New Mix: Sufjan Stevens, Gorillaz, Perfume Genius, More" (radio). All Songs Considered. National Public Radio. Retrieved March 30, 2017. ^ "Sufjan Stevens Soundtracks New Film Call Me By Your Name". Pitchfork. Retrieved January 7, 2017. ^ "Sundance Film Review: Call Me by Your Name". Consequence of Sound. Retrieved January 28, 2017. ^ "Hear Sufjan's New Song "Mystery of Love" in New Call Me By Your Name Trailer". Pitchfork. Retrieved August 17, 2017. ^ "Details About Sufjan Stevens' Call Me By Your Name Songs Emerges From Sundance". Stereogum. Retrieved January 27, 2017. ^ "Call Me By Your Name (2017)". Rotten Tomatoes. Retrieved December 27, 2017. ^ "Sufjan Stevens - Tonya Harding (Official Audio)". YouTube. Retrieved December 18, 2017. ^ "Tonya Harding". Asthmatic Kitty Records. Retrieved December 18, 2017. ^ "'I, Tonya' Filmmakers Rejected Indie Rock Darling Sufjan Stevens' 'Tonya Harding' Song". Variety. Retrieved December 18, 2017. "Sufjan Stevens Seven Swans". Allmusic. Retrieved August 5, 2016. "100 Best Albums of the 2000s". Rolling Stone. Retrieved August 5, 2016. "Carrie & Lowell by Sufjan Stevens: EW review". Entertainment Weekly. Retrieved August 5, 2016. "ALBUM OF THE WEEK: SUFJAN STEVENS". NOW. Retrieved August 5, 2016. "Brooklyn songman cooks up carols for the discerning indie rocker". robertchristgau.com. Retrieved August 5, 2016. "Sufjan Stevens: Illinois". The A.V. Club. Retrieved August 5, 2016. Borges, Mario Mesquita. "Sufjan Stevens". Allmusic. Retrieved March 31, 2015. Blanton, Kristen (March 5, 2012). "The 25 Best Sufjan Stevens Tracks". Paste. Retrieved November 11, 2017. MacSwain, Robert; Worley, Taylor (September 20, 2012). Theology, Aesthetics, and Culture: Responses to the Work of David Brown. OUP Oxford. p. 158. ISBN 9780199646821. Retrieved November 11, 2017. "Sufjan Stevens Silver & Gold: Songs for Christmas – Volumes Six-10". PopMatters. Retrieved August 5, 2016. .
^ Roark, David (March 29, 2015). "How Sufjan Stevens Subverts the Stigma of Christian Music". The Atlantic. Retrieved March 31, 2015. ^ "Adz And It Shall Be Given Unto You: Sufjan Stevens Interviewed". The Quietus. Retrieved August 6, 2011.